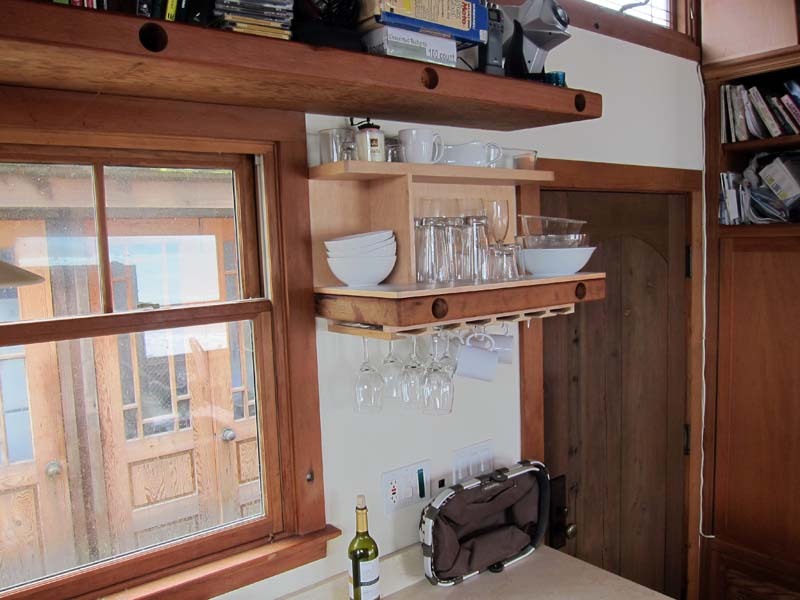 Rick Samish of Fine Line Cabinets in Menlo Park, CA created some custom cabinets and doors for my Pacifica beach rental cottage. Below are some pictures. Click on any picture for a much larger version. 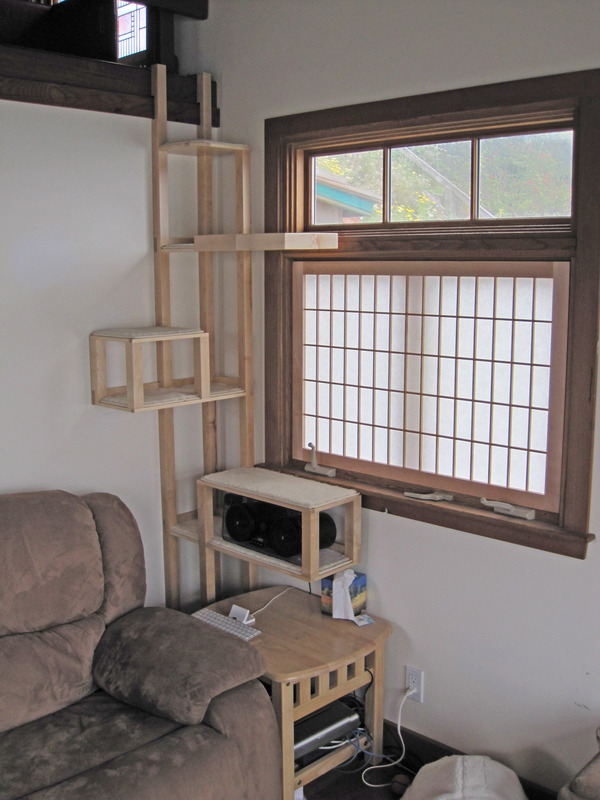 Below is a cat tree custom designed for the corner you see it installed in. It grips the railing at the top with an adjustable clamp, and you can see it has a set of iPod speakers (the black things) resting inside one level. Click here for my original diagram I gave to Rick, and click here for a 3D PDF Rick created before he started work. 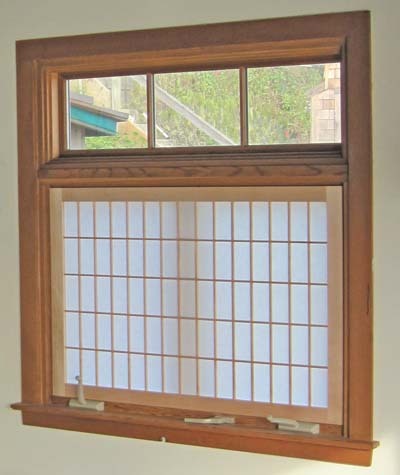 (Side note: the shoji screen in the window is also from Rick, built earlier). 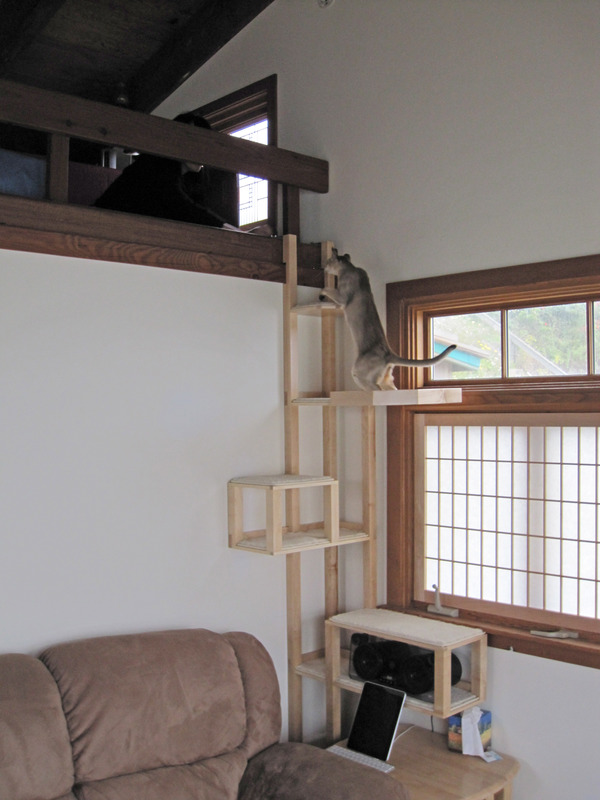 A few minutes later the kitty discovered the cat tree and started hanging out on what I call the "diving board". The cat has never been able to get into the loft before this moment. Here he is jumping up into it (you can see Katherine enticing him up for the first time). 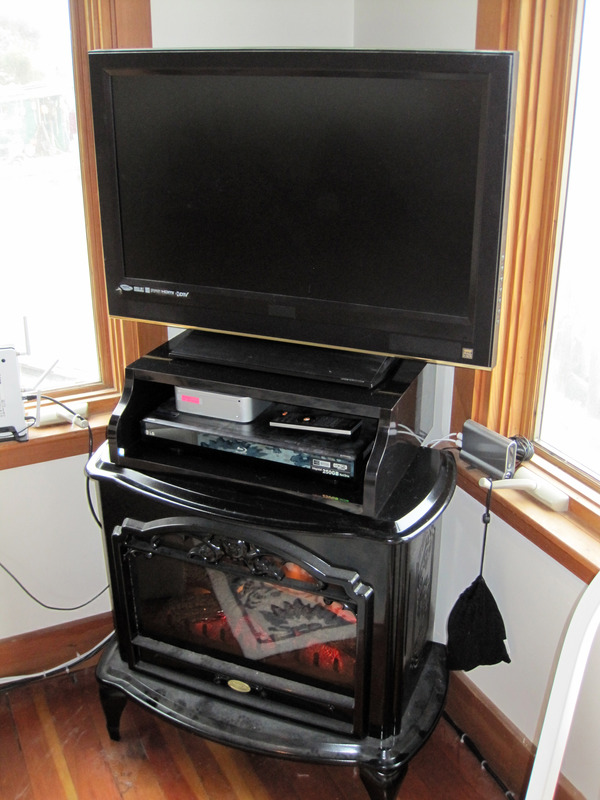 Rick built the shiny black "piano case" looking box under the TV (and on top of the Dimplex electric fireplace). This replaced a couple 4x4 boards I was propping the TV on. It is laminated with a shiny black plastic (essentially Formica) and looks GREAT. I couldn't find anything "off the shelf" that was only tall enough for the blu-ray player and the Mac mini that drive my TV. 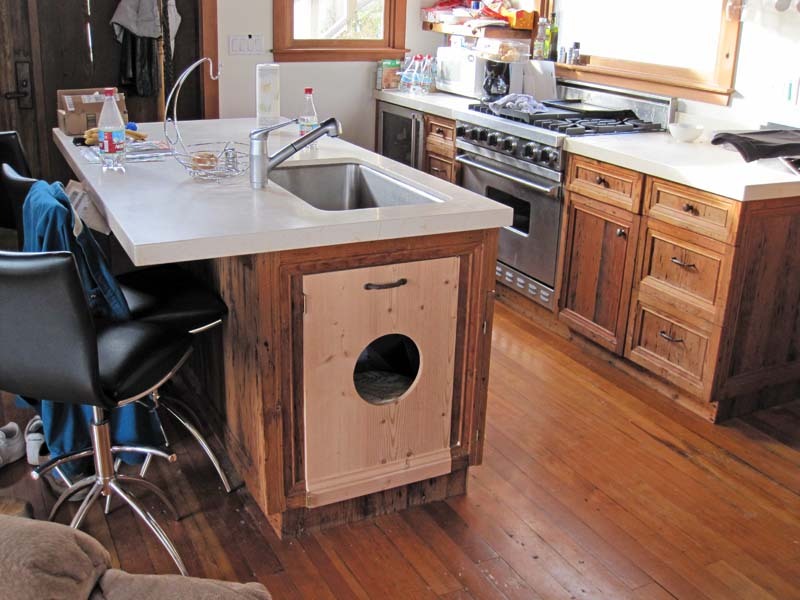 The round portal hole under the sink is a cabinet door into a kitty litter box. 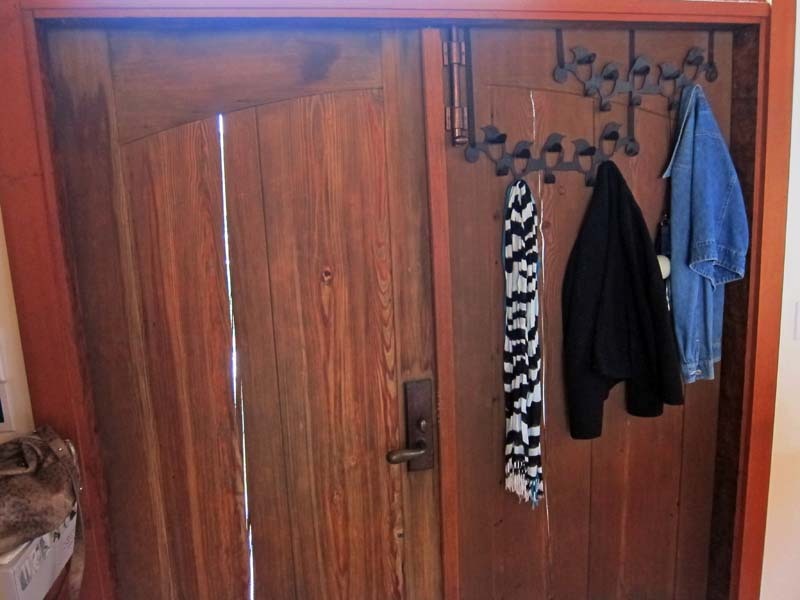 I did not want to cut a hole in the original door, so Rick made this replacement door with the hole in it. It is unfinished in the picture below and just resting in place (not mounted properly yet). Here is the kitty leaving the portal. It still is not mounted, just resting in place. 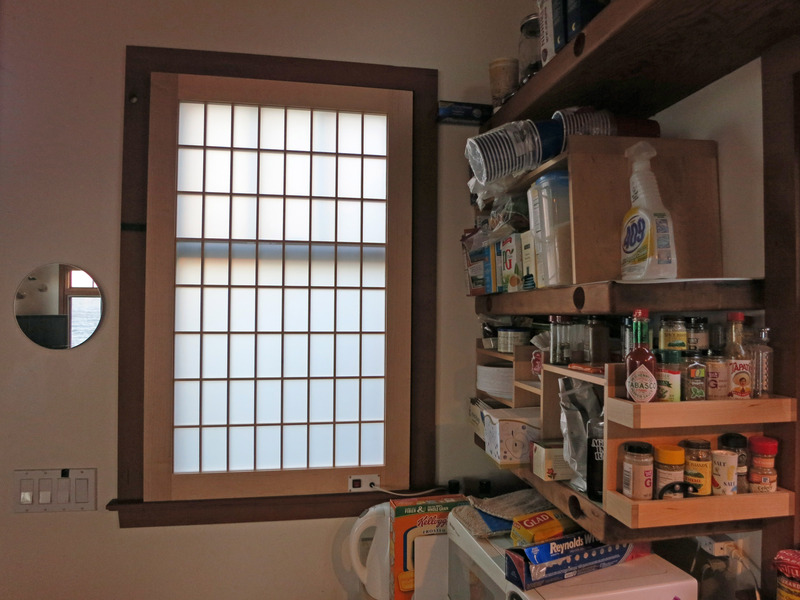 Rick made the custom sized shoji screen that fits like a jig-saw-puzzle piece into the window seen below. It can be lifted out of that position in seconds. 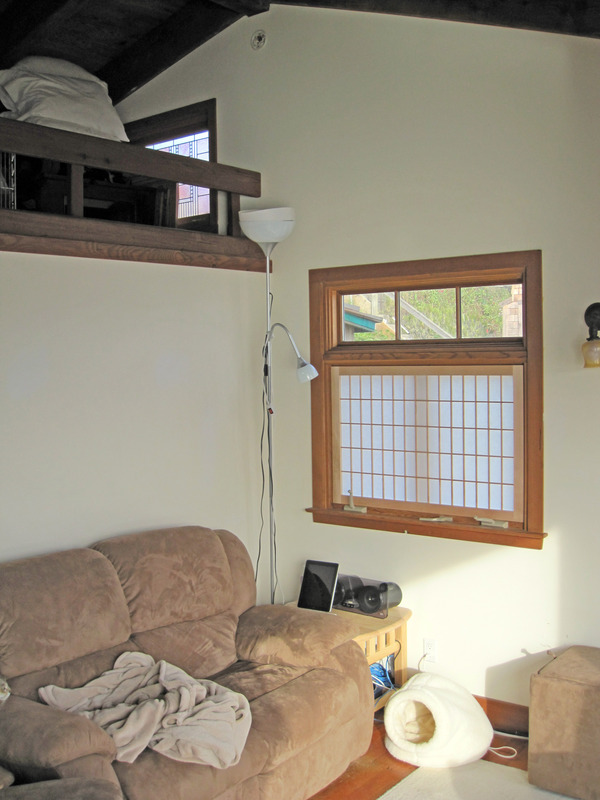 This provides a little privacy from the neighbors while still letting in light. Here is a panorama of the main living room of the beach cottage. 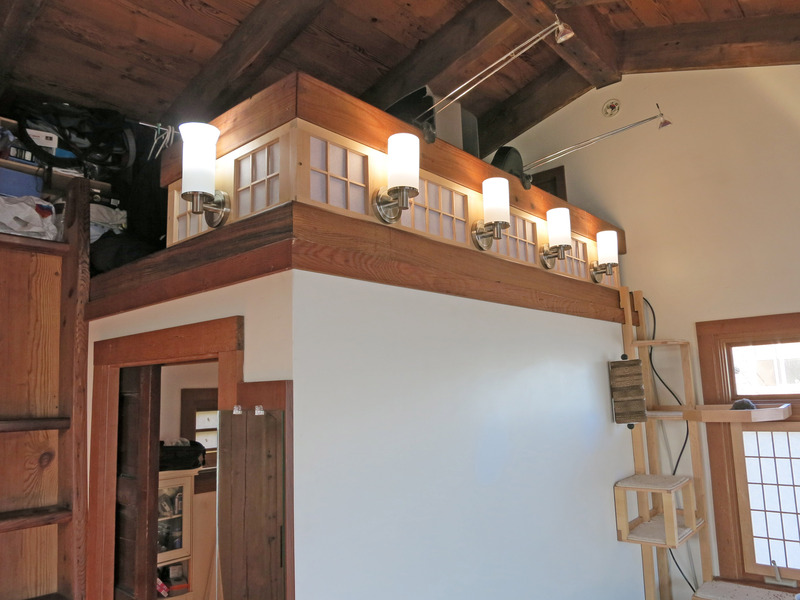 The shoji screen is on the far left, and you can see the waves and beach through the front windows. 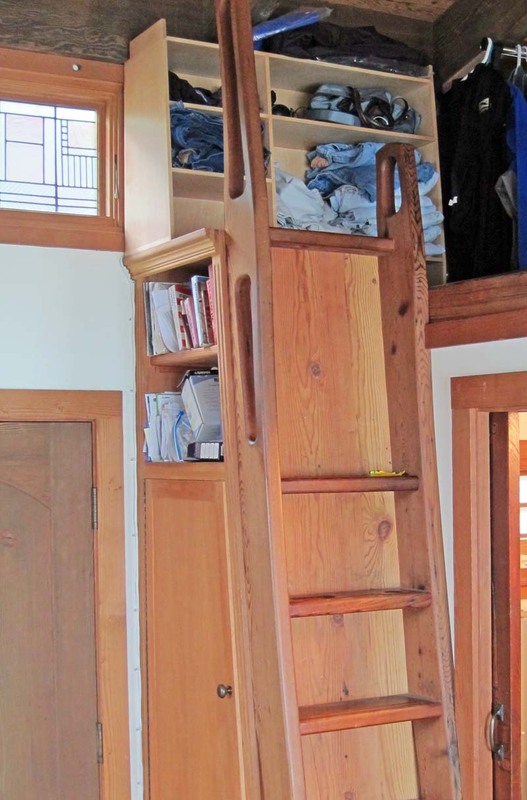 The odd-shaped door under the ladder into the loft below hides a custom "ironing closet". 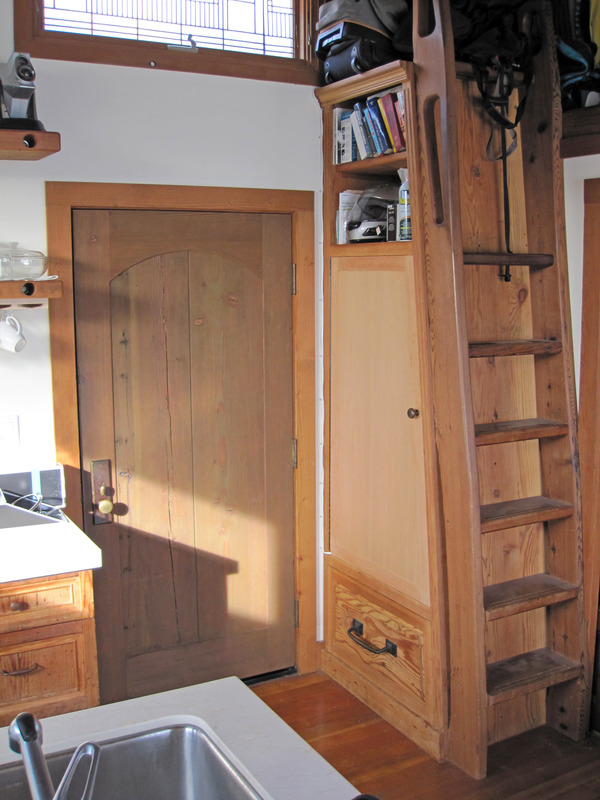 Rick made the custom door with the piano hinge to fit so that I could preserve the original door safely away. 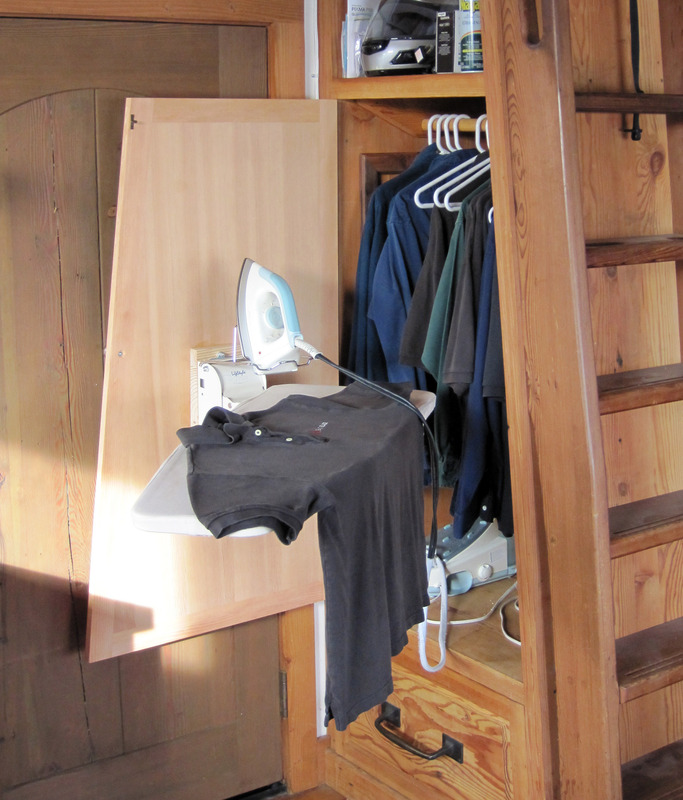 Here is the custom ironing closet swung open so you can see the hidden ironing board folded up. Below you see the ironing board almost fully extended. It is a Better Lifestyles Folding Ironing Board. 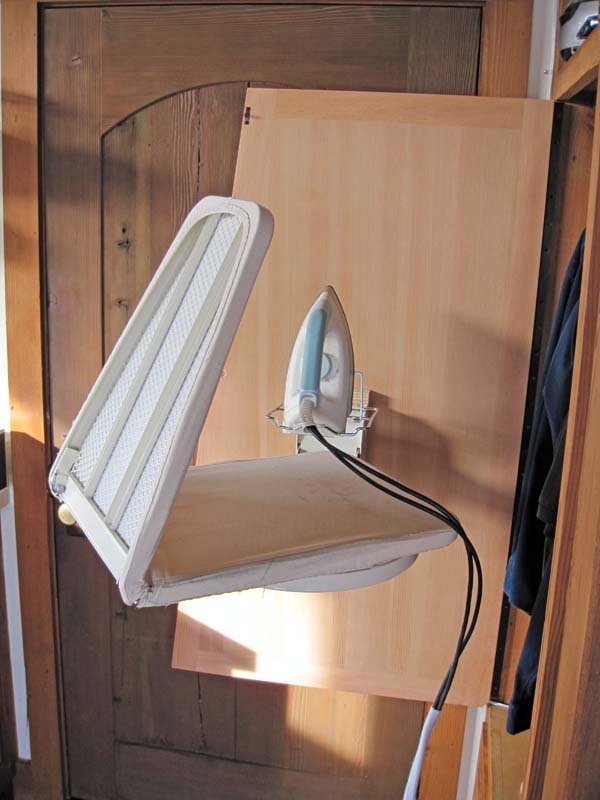 You can rotate the ironing board to any orientation. Also notice there is no supporting leg, which is very nice for ironing (nothing gets in the way) but required a long piano hinge on the door to provide strong support while ironing. Below it is fully extended with a shirt on it ready to be ironed. 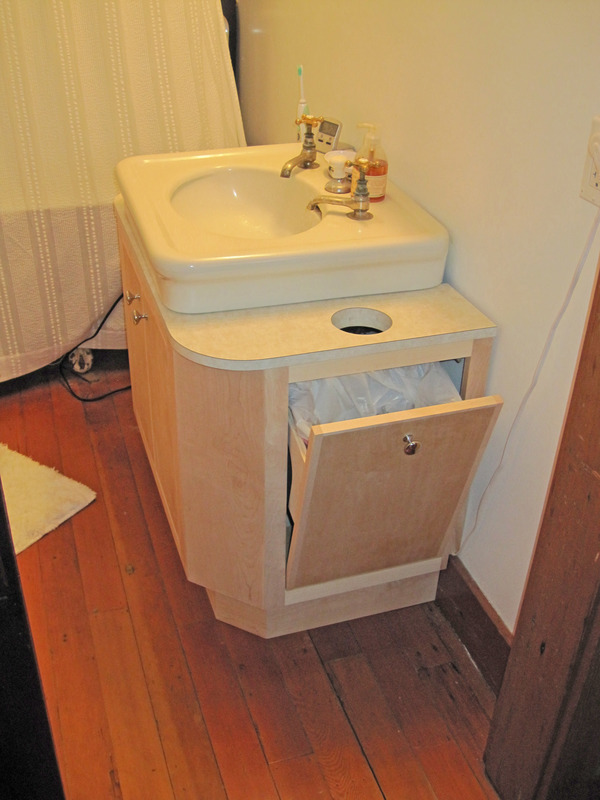 Rick made this vanity which wraps around the pedestal in the bathroom. 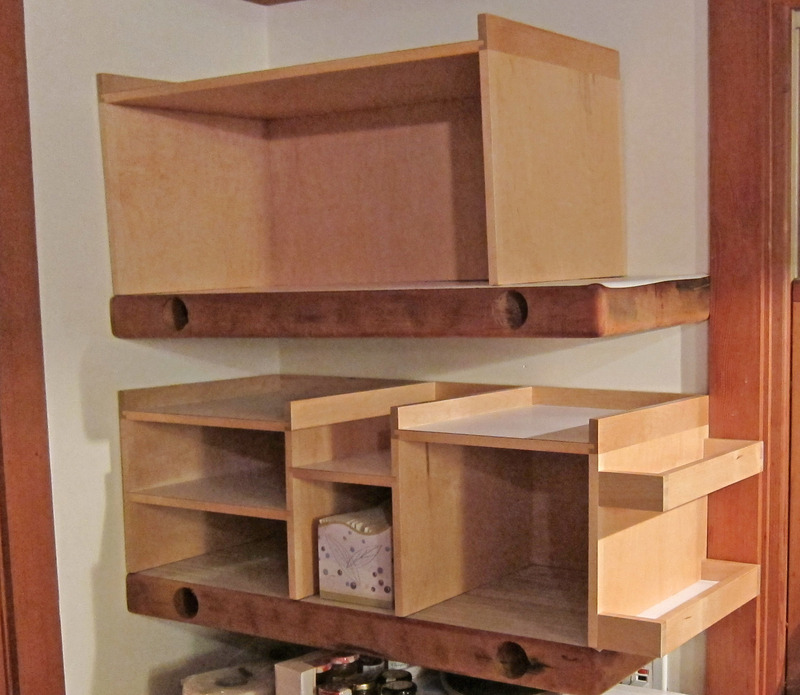 On 3/15/2011 Rick finished these "inserts" for the kitchen shelves to sub-divide the large kitchen shelves into more levels. 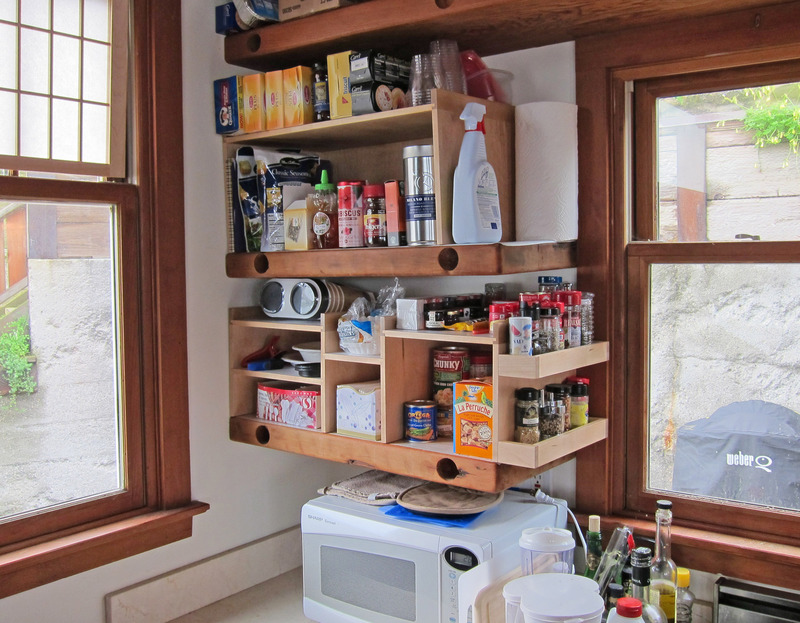 The picture below is of the "empty" new shelf inserts without being filled with stuff. 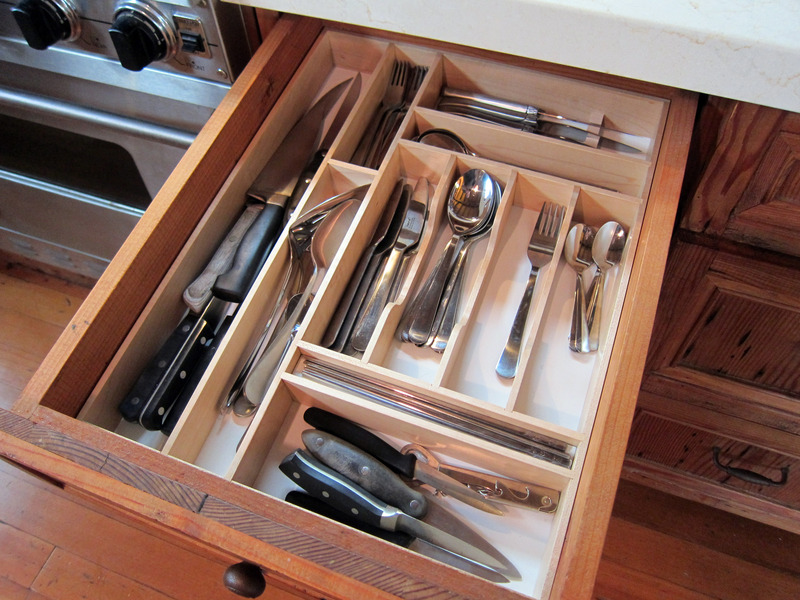 Below is the same picture, but filled with stuff. Here is another insert showing a different design. 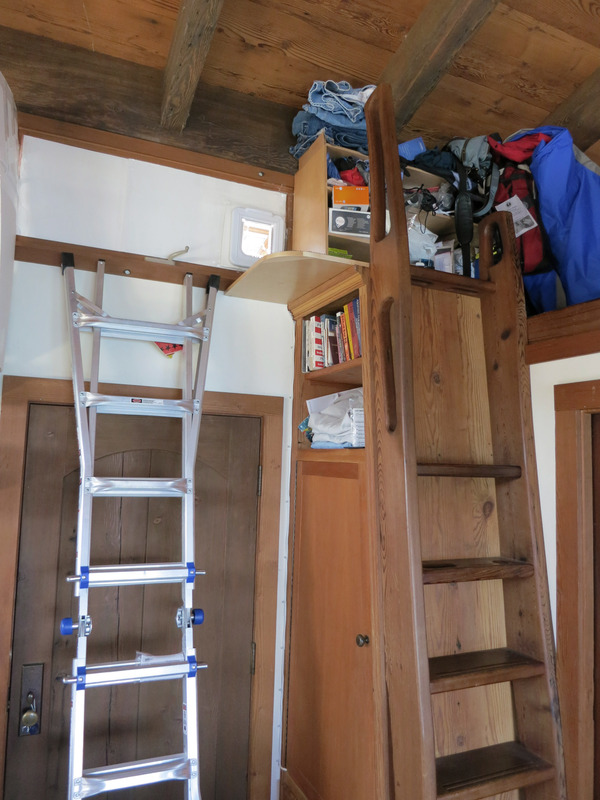 Also at this time Rick finished a custom shelf for the top of the loft ladder. 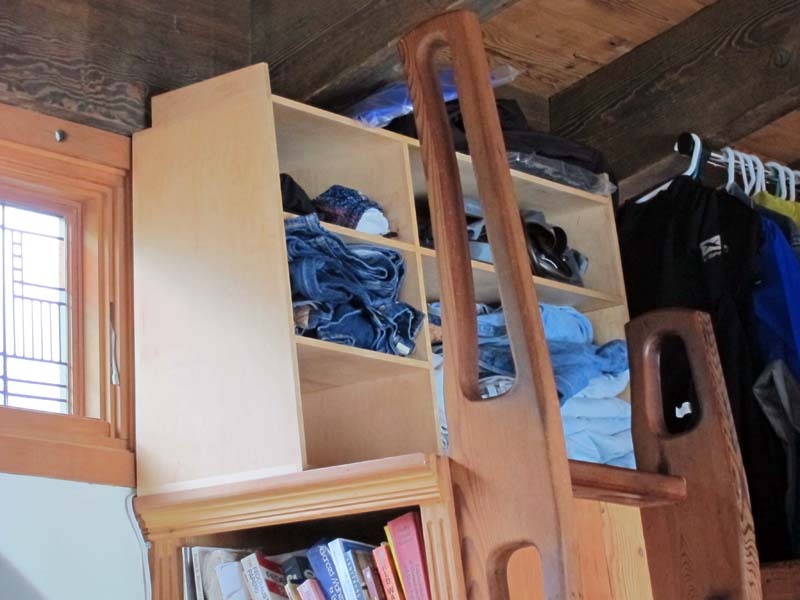 Although at first glance this doesn't look like it needed to be custom, if you look closely there are little notches in the back to fit back against the beam, and the real trick is the right "leg" is 8 full inches taller than the left leg which creates another cubby hole and allows the whole shelf to be much larger. A closer up view of the shelves at the top of the loft ladder. Below is NOT Rick's work, it is the location of a future project. 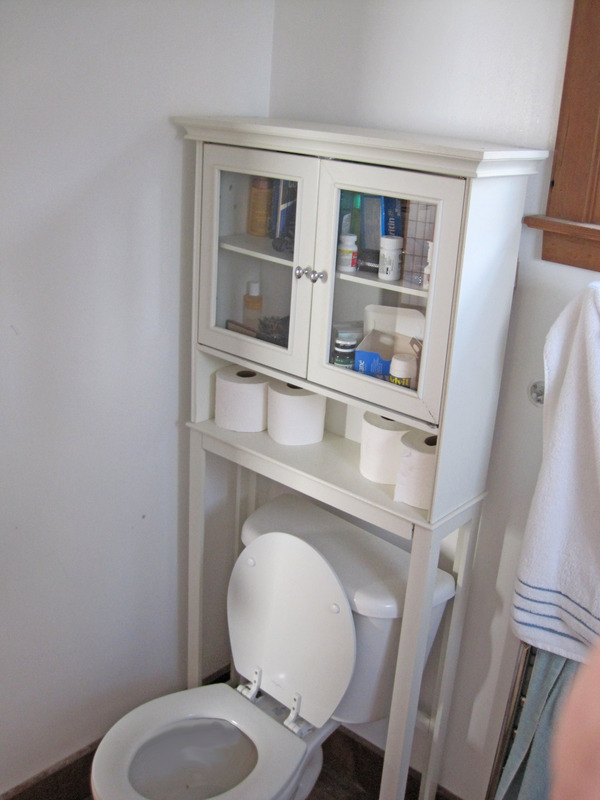 I want to replace the white cabinet below with a larger custom piece with hangers on the side for robes. 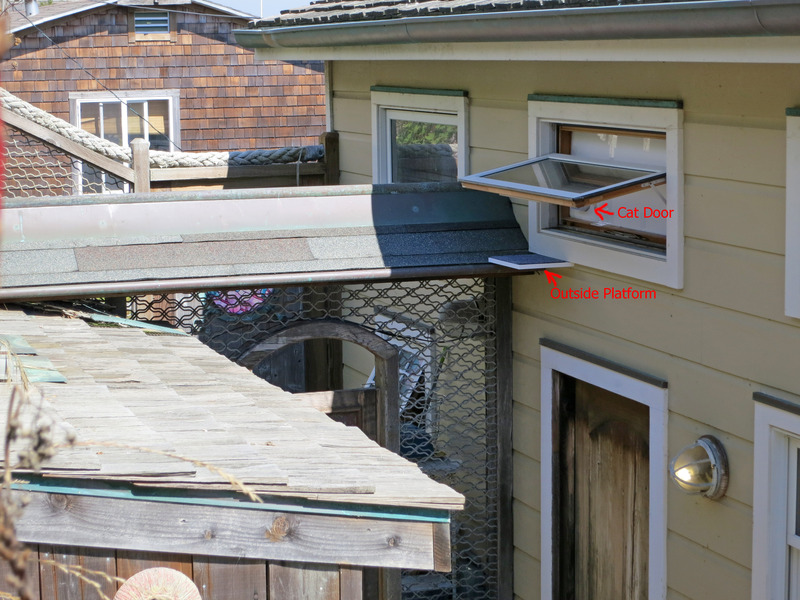 Below shows "stage 2" of an experiment where we allow only one of our two cats to come and go out of the house and definitely don't allow the dog in and out (or allow any neighbor cats into the house). 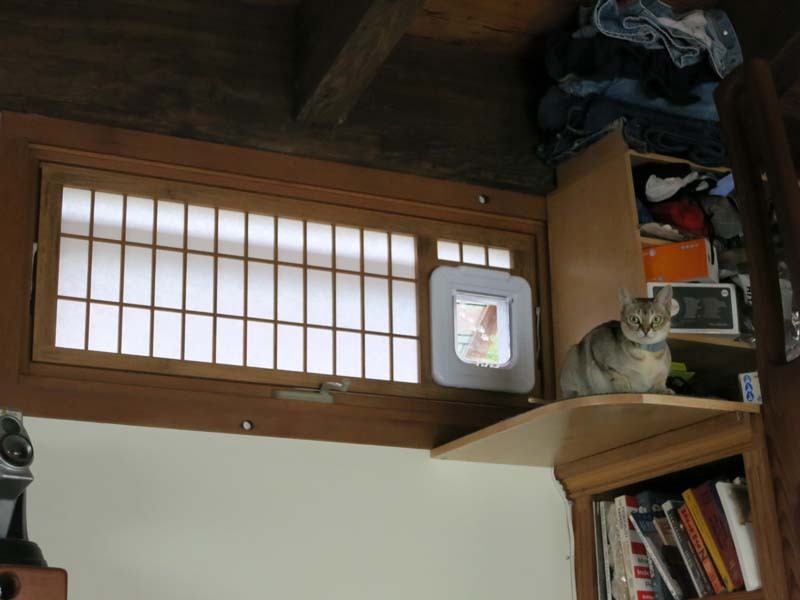 The idea here is to install an "intelligent cat door" on the second floor that only opens for the cat wearing one particular radio collar (it isn't really RFID, I'm not sure the actually technology). 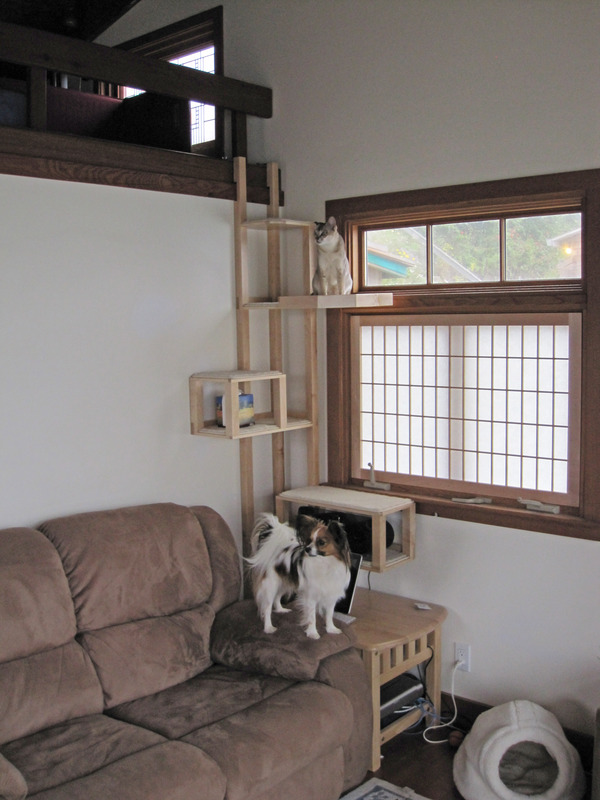 We had to build a couple of platforms for the kitty to come and go comfortably. 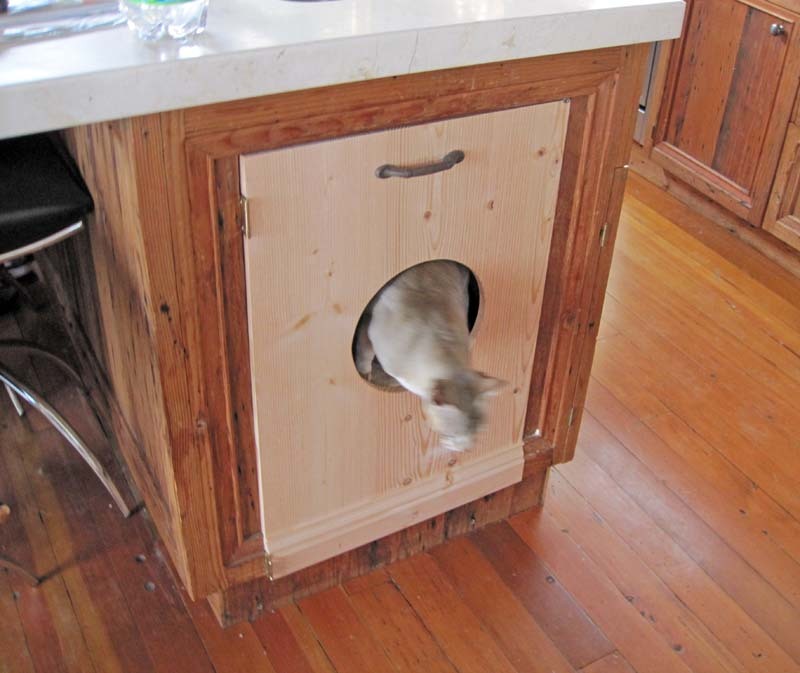 The cat door is called a "Cat Mate Elite Super Selective Cat Door". 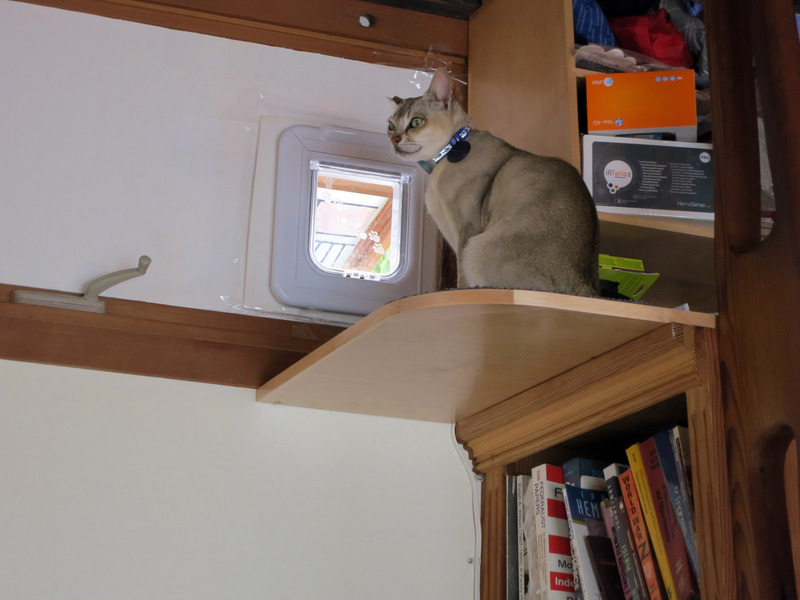 In the picture below we are still using foam poster board to hold the cat door in place to make sure this works. Below is the inside view. Below is the outside view and outside platform. 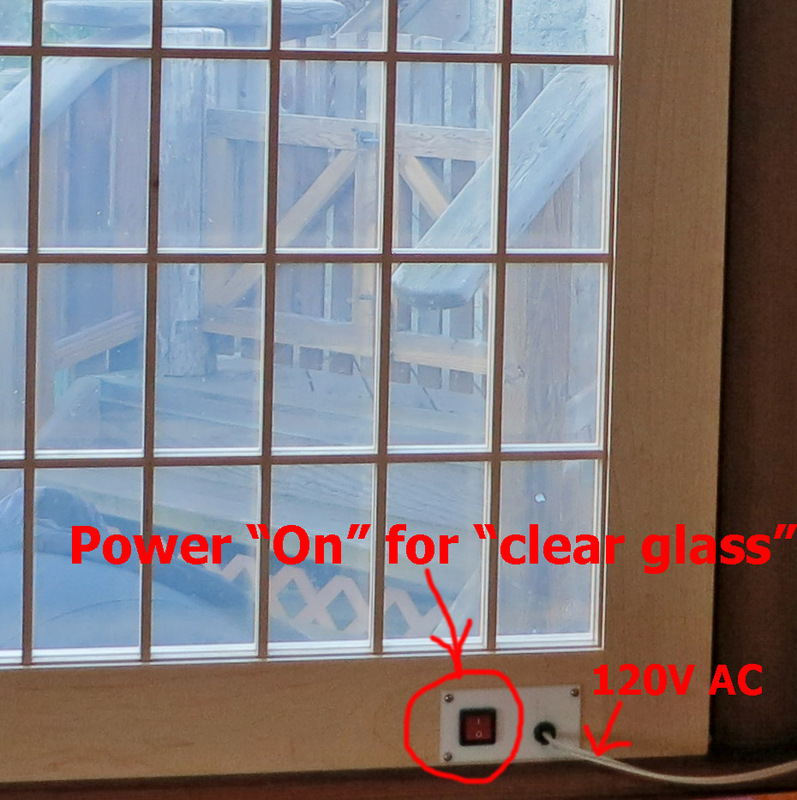 Final Smart Glass (also known as "Privacy Glass") shoji fully installed, below it is in "clear glass window" mode. 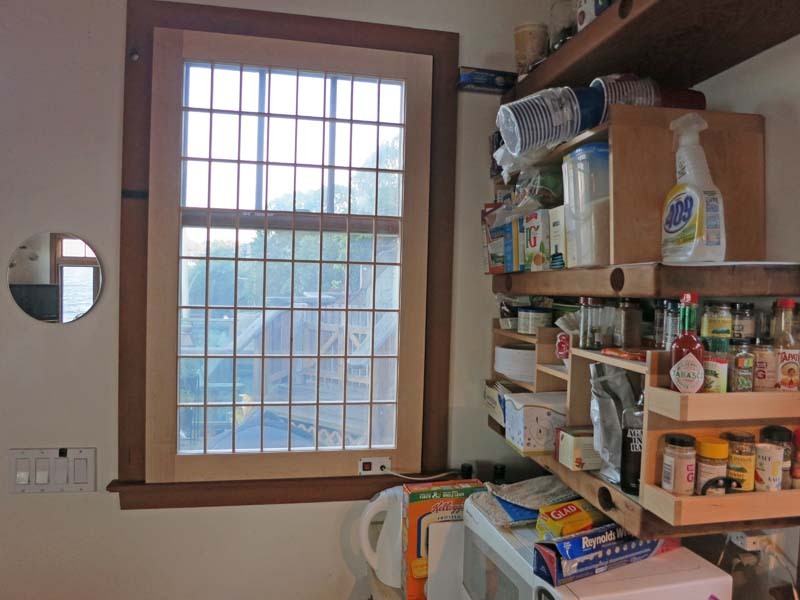 It really is as transparent as glass, the "fogginess" of the window is due to light coming from outside and would appear this way in any picture. A close up of the light switch. 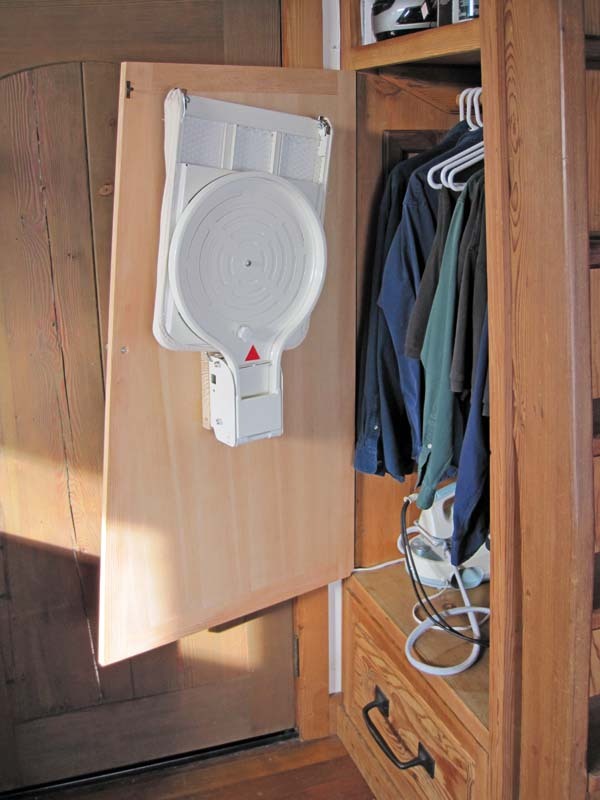 It is very simple wiring, 120 V directly into any regular wall outlet. With no power supplied, the window is opaque (you cannot see through it), the clear setting you see below draws 0.09 Amps, 3 Watts, 120 Volts, AC (regular outlet alternating current). 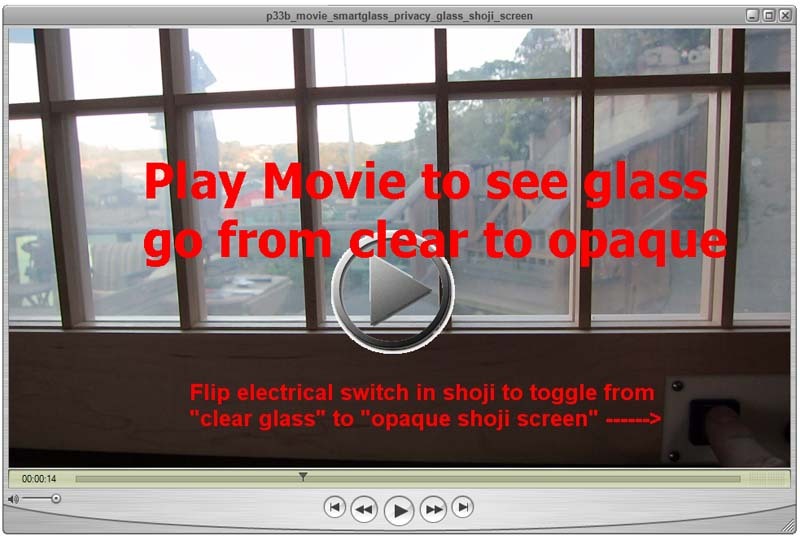 Below you can see the shoji in "opaque" or "privacy" mode. 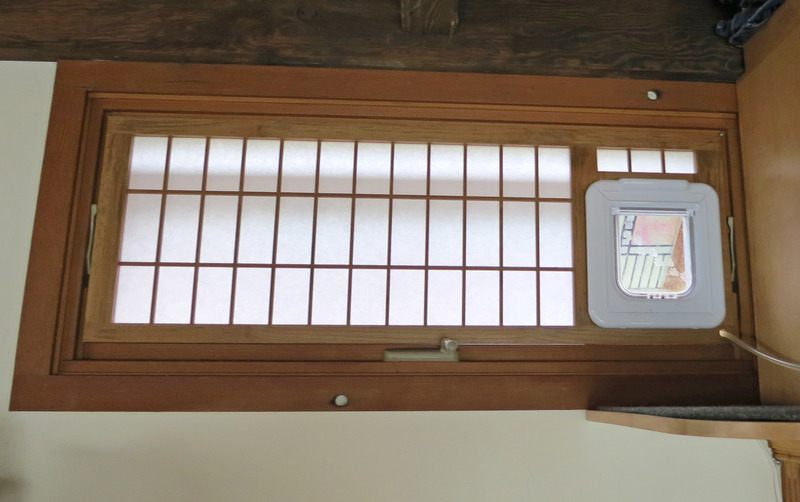 In this mode it appears very much like a traditional shoji screen. A short 20 second movie showing the glass in operation: Click here for a very high quality original movie in Quicktime Format (Windows computers probably cannot play this).